Torrey Brown, with his round face and pink cheeks, may look like a pushover, but don't let that fool you. He stands his ground when he believes in something. In the mid-1980s, while serving as Maryland's secretary of natural resources, Brown instituted a ban on catching rockfish in the Chesapeake Bay. The move was necessary to keep the population from crashing, but fishermen vehemently opposed the decision. "I was told I shouldn't go on the Eastern Shore without police protection," Brown says. At one particularly memorable meeting, an old waterman lifted up his shirt to expose a lump on his back. "He said, 'See, I got this cancer. And before I die, you're gonna die,'" Brown recalls. "I think he was more joking than serious. But he was very unhappy." Torrey Brown Brown hasn't always been an environmental activist. In fact, he started out in medicine. "I wanted to be a doctor all my life," he says. In 1957, he moved from the Chicago area to Baltimore to attend Johns Hopkins' School of Medicine. (More than 50 years later, though he says he didn't expect to stay in Maryland, he pronounces Baltimore — "Bawlmer" — like a native, lists crab as his favorite food, and addresses a reporter as "hon.") After completing his residency in internal medicine, Brown joined the faculty, eventually becoming assistant dean of the School of Medicine and then vice president of Johns Hopkins Hospital. Meanwhile, he served as a state legislator. "I was a doctor and a politician," he says. The Maryland General Assembly only meets three months out of the year, so he was able to do both. Brown had always been a fan of the outdoors — a child he camped, hunted, and fished — but it wasn't until he served as chairman of the House Environmental Matters Committee that he became devoted to protecting the state's natural resources. 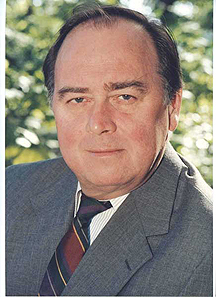 In 1983, he accepted the position of secretary of Maryland's Department of Natural Resources. At the time, it seemed like a temporary diversion from medicine. "I thought I'd do it for a few years and then come back to practice and do research," he says. Instead, he stayed, serving for 13 years under Governors Harry R. Hughes and William Donald Schaefer. 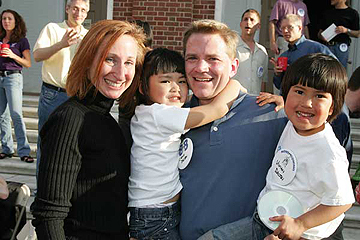 During his time as secretary, Brown became a driving force behind the push to clean up the Chesapeake Bay. In the mid-1980s, the bay "really had its troubles," he says. "Had we done nothing, it would be literally dead now." The rockfish ban wasn't Brown's only showdown with local interest groups. He also angered homeowners when he fought to turn an abandoned rail corridor into a 21-mile recreational trail. "They didn't want people coming through their front yards," he says. Formerly called the Northern Central Railroad (NCR) Trail, it was renamed after Brown in 2007 and now hosts more than 850,000 visitors each year. 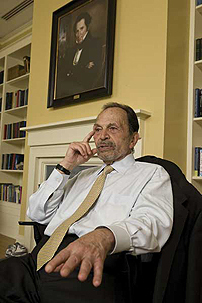 These days Brown, who received the 2008 Johns Hopkins Alumni Association Woodrow Wilson Award for distinguished public service, is involved with a number of organizations. He serves as a board member of Family Health International, vice chair of the Chesapeake Bay Trust (which he helped establish), and chairman of both the Oyster Recovery Partnership and the Chesapeake Bay Environmental Center. He has also returned to his roots as a researcher, serving as chairman of the board of Intralytix Inc., a biotech firm he co-founded in 1998. The company's goal is to find useful applications for phages, the tiny viruses that infect bacteria. Brown thinks they may hold promise in the realm of food safety or as an alternative to antibiotics. If there are naysayers, Brown will take it in stride. He's found that, given enough time, people seem to come around. The homeowners who originally opposed the NCR Trail are now some of its biggest supporters. And the fisherman who threatened Brown's life? His tumor was benign. "He still catches crabs in Baltimore County, and he catches rockfish now because we banned them for five years," Brown says. "He's become a great friend." Although his accomplishments in international public health are broad and varied, Gerard Dubois may be remembered for his most recent achievement: He is the guy who took cigarettes away from the French. A Frenchman and former fumeur himself, Dubois has been fighting France's notoriously widespread addiction for 20 years. On January 1, 2008, his work paid off. Smoking was officially banned in all public places. Though pleased by his recent accolade, Dubois is most eager to talk about the smoking ban, and is particularly proud of the backing the new law enjoys: "We have the support of the majority of smokers, and 80 percent of the country," he says. "We're getting youngsters, too." After receiving his master of public health degree from Johns Hopkins in 1973, he worked as an epidemiologist studying chronic diseases. Troubled by statistics indicating the dangers of alcohol and tobacco consumption, in 1983 he joined the High Committee on Alcoholism reporting to the Prime Minister. After four years of little progress, Dubois and a colleague went after television advertising and succeeded in banning alcohol ads. "That was critical in France — in wine country — to succeed," he says. Shortly after, with support from Prime Minister (and later President) Jacques Chirac, Dubois and four colleagues — collectively dubbed "the Five Wise Men" by the media — drafted a report on public health organization that resulted in France's first major anti-tobacco law, 1991's Loi Evin. The law banned tobacco ads, forbade smoking on public transport, and mandated health warnings on cigarettes, among other measures. Throughout the 1990s, Dubois, then chair of the French National Committee Against Smoking, waged war in court, dragging major tobacco companies onto the stand. In 2003, Dubois became chairman of the French Alliance Against Tobacco and began working toward a full ban of smoking in all public places. 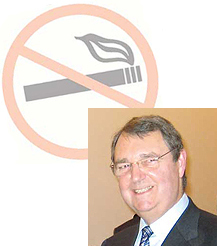 He succeeded in getting a two-phase regulation enacted, which in February 2006 banned smoking in the workplace and in January 2008 banned smoking in all public places. Among his career accomplishments, Dubois counts a 50 percent decrease in cigarette smoking since 1991, and the success of his 2003 publication, Le Rideau de Fumée (The Smoking Screen), which exposed tobacco industry documents. He is optimistic that other European countries will follow France's lead. "More and more countries are implementing this kind of regulation," he says. "It's an epidemic." A precocious free spirit is coming of age in India just as the colony's own demand for independence entangles with World War II: colonialism, caste, class, familial strictures, rampant sexism. For all that, the epoch seems less riven than our own — a heroine, and no heroin! The author — an adjunct faculty member at the University of Rhode Island's Graduate School of Oceanography and director of graduate diversity affairs — was won over by her love of words to produce this first novel, geared toward young adults. The stairs of the title lead to the library. It's a tad didactic but keeps pace with the likes of the Gershwins' toe-tapping "I'll build a Stairway to Paradise, with a new step ev'ry day." At 193 pages, this how-to is all about process. Though it's ultimately for students, this review is aimed more at their parents. You can take heart that Gelb's counsel is honest and applicable to all narrative writing. He insists that your aspiring collegian can engage harried admissions offices only through introspection and hard work. That the book is needed reflects the shortfall of much current high school English instruction. Accordingly, it should also help your student write his or her way through the eventual university courses. John Freccero: "When you read Dante and don't understand it, you know its your fault." T.S. Eliot wrote that "Dante and Shakespeare divide the modern world between them; there is no third." 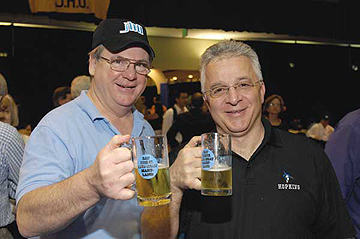 John Freccero has devoted his career to studying the former, but indicates that, given the opportunity, he'd rather hang out with the latter. Shakespeare, he says, would be the loud friend who's quick to toss out a lewd remark or buy another round at the bar. 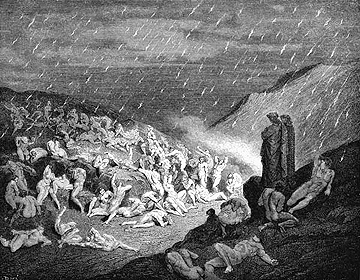 Dante would be the quiet one in the corner looking on with a disapproving air. "You wouldn't want to grab a beer with him. He's so austere and rigid," says Freccero, the country's leading expert on Dante and The Divine Comedy. "When you read Dante and don't understand it, you know it's your fault." This May, Freccero received the Johns Hopkins Alumni Association Distinguished Alumnus Award in honor of his 50-year career as a teacher. Over the years, he says, he's seen the way The Divine Comedy can captivate students in his New York University classes. "Dante grabs them all," he says. "The fascination goes from, 'What the hell is this all about?' to real wonder." In his research and in the classroom, Freccero says, he tries to reconstruct the intellectual context in which Dante worked, using medieval philosophy, theology, science, and customs to inform his readings. "One is never quite sure if we use the Middle Ages to interpret Dante or if we use Dante to interpret the Middle Ages," he says. It seems natural that Freccero chose to devote his academic studies to Dante. In one of his earliest memories, he's a boy sitting on the lap of his Italian immigrant grandfather, staring at the frightening images accompanying The Inferno. "There is no Italian of my grandfather's generation who didn't know Dante," Freccero says. "That's one of the things that's so bizarre about him, that he is at once the most learned and the most popular of poets. Can you imagine a barber in Baltimore reciting Shakespeare? Of course you can't. But you can't imagine a barber in Italy not knowing Dante." Dante wasn't foremost in Freccero's mind when he came to "The Hopkins," as he still calls it, on a partial athletic scholarship in 1949. Freccero earned his bachelor's and master's degrees in Romance languages without giving much serious thought to the Italian poet, until a French-speaking literary critic from Belgium put the idea in his head during his PhD studies. Georges Poulet's talks on Dante "totally seduced me," Freccero recalls. Poulet, then head of Hopkins' Department of Romance Languages, encouraged Freccero to study Dante. He did, working so closely with legendary professor Charles Singleton that many consider him Singleton's intellectual heir. In 1958, Frecerro completed his PhD in Romance languages, then taught at Hopkins, Yale, and Stanford before landing at NYU in 1992. Nearly half a century later, Freccero says he still reads something by or about Dante every day. "There's not just one problem that overwhelms me in The Divine Comedy," Freccero says. "I know I won't settle all the questions I have in my lifetime." So if he had the chance to have Dante to dinner, what one thing would Freccero ask him? It's a moot point because Dante wouldn't come, Freccero says of the sober poet. "He would be fasting." People had told Willie C. Bush that no bank would loan a black man money to start a company with one truck. So he found a bank that loaned him money for a fleet instead. His daughter, Esther, then in grade school, watched with fascination as the trucks rumbled into town, taking a lesson from her father that she could accomplish anything she set her mind to. Except drive a truck. "I thought it was awesome to see my father park [an 18-wheeler]," she says, remembering the ease and skill with which he could maneuver an enormous vehicle into a tight space. But Willie didn't think his girls should drive trucks or climb trees like boys do. "My father wouldn't teach me!" says Bush. Esther Bush So she continued to focus on school, encouraged by her parents to go to college. She received her bachelor's degree from Morgan State University in Baltimore, then went on to earn a master's degree in guidance and counseling at Johns Hopkins. In 1980 Bush became the assistant director of the Labor Education Advancement Program for the National Urban League, an organization in New York City that has for nearly a century advocated for African Americans. 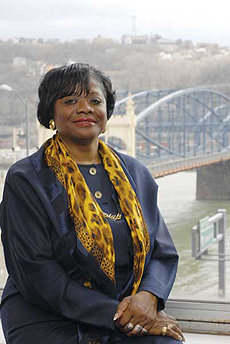 In 1994 she became the Greater Pittsburgh Urban League's CEO and president — the first woman to hold the position. Talk about maneuvering in tight spaces. When Bush took the wheel of the Pittsburgh chapter, it was $329,812 in debt and 90 days behind in paying bills. After a decade and a half under her leadership, the chapter is now financially sound. Bush oversees 76 employees and a $6.7 million budget — and much of the chapter's success is due to her tireless and infectious enthusiasm. Bush describes her efforts with the Urban League as a calling — "It doesn't feel like work!" she says — and believes that education not only helps African Americans advance socially and economically, it helps all Americans better understand issues of race. She is especially proud of having founded the Urban League of Greater Pittsburgh Charter School, the city's first charter school, in 1998. The school has 40 employees and more than 200 students, who are predominantly African American. K-5 students attend school 215 days a year, taking Spanish and Japanese, and advanced math and science. Parents must volunteer at the school and meet with teachers. "Parental involvement is key to academic success," Bush says. Sixty-seven percent of fifth-grade students at her charter school score at proficient or advanced levels in reading on state exams, and 75 percent score at proficient or advanced levels in math, outperforming their public school peers. (Of economically disadvantaged students throughout Southwestern Pennsylvania, only 43 percent are proficient in reading and 58 percent proficient in math.) And this year, Bush is especially excited to report, one female student was accepted into four private schools, a first for the school. Says Bush, "We absolutely push the girls and the boys to be anything they want to be." Steven Jarvi, Peab '03 (MM), has been appointed the new assistant conductor of the Kansas City Symphony, effective July 1. Recently Jarvi was a conducting fellow for the New World Symphony in Miami and an associate conductor of the New York City Opera at Lincoln Center. Rick Marrs, A&S '83 (PhD), in April was appointed dean of Seaver College, Pepperdine University's undergraduate college. Previously, Marrs had served for seven years as chair of the religion division and for five years as associate dean of Pepperdine. Gail McGovern, A&S '74, was named president and CEO of the American Red Cross in April. The former executive at Fidelity Investments has served on the faculty of the Harvard Business School since 2002 and is a Johns Hopkins University trustee. Claudia Morrissey, SPH '92, was installed in March as the 94th president of the American Medical Women's Association. Founded in 1915, the AMWA works to advance women in medicine and improve women's health through advocacy and education. Mark Poirier, A&S '94 (MA), wrote the screenplay for Smart People, a feature-length film released by Miramax in April and starring Dennis Quaid and Sarah Jessica Parker. Miriam Were, SPH '81 (PhD), in March was named Japan's outstanding achiever (laureate) for the Hideyo Noguchi Africa Prizes. Were, who chairs Kenya's National AIDS Control Council, was honored for achievements in the fight against infectious disease in Africa. She received 100 million yen (about $10,000) for the prize. $46,133,559 raised by Reunion classes. 4,151 Homewood alumni back on campus. 2,856 crab cakes served at the pre-game lunch. 70 events, from Alumni Colleges to reunion dinners. 15 Reunion classes spanning 70 years. Alumni packed the stadium for the Blue Jay men's lacrosse victory. 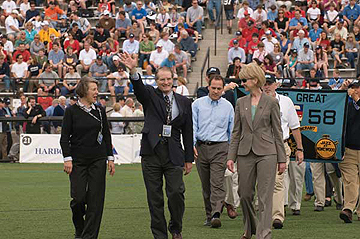 President William R. Brody and wife Wendy Brody lead the parade of the 50th and 25th Reunion classes with Provost Kristina M. Johnson, Krieger School Dean Adam Falk and Whiting School Dean Nick Jones. A toast at the crab cake lunch to "Eat, Drink, and Beat Maryland!" Class gift co-chair Amy Marshall Lambrecht, A&S '88,meets the daughters (Grace, 5, and Vivian, 3) of Reunion program chair Chris Dalton, A&S '88, at the Class of 1988 family picnic. 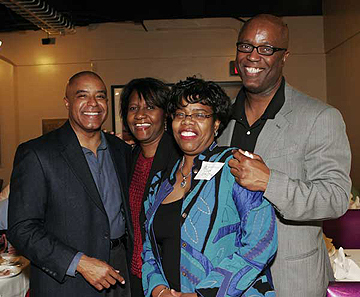 From left: George Dredden, A&S '77; Jocelyn Kennedy-Stephenson, Engr '78;Judy Smith, Engr '79; and Steven Eaddy, A&S '78, celebrate in Levering Hall. 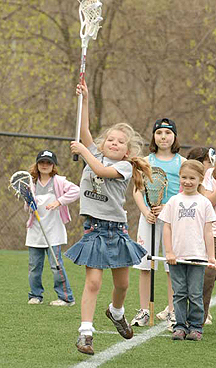 A Junior Jay reaches for the stars at the annual lacrosse clinic. 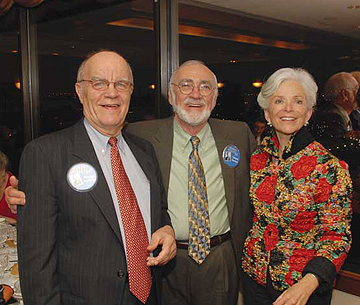 George Hudgins (left) celebrates his 50th Reunion with Sandra Lee and Gilbert Decker, who was presented with the Johns Hopkins Alumni Association Distinguished Alumnus Award during Reunion weekend. When members of the Class of 1958 arrived at Homewood their freshman year, they began a lifelong friendship with Bob Scott, A&S '52, who had just returned to his alma mater as the coach of the football team, the start of an illustrious coaching career. In celebration of its 50th Reunion, and to honor a friend and colleague, the Class of 1958 established the Robert H. Scott Endowed Scholarship Fund to provide financial assistance to students on the Homewood campus. 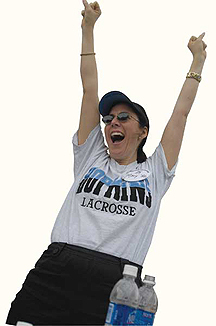 Scott was head coach of the Blue Jays men's lacrosse team for 20 years and guided seven national championship teams. During that time, he was honored as National Coach of the Year three times and College Coach of the Year twice. After retiring from coaching, he served as athletic director at Johns Hopkins for 22 years and was inducted into the National Lacrosse Hall of Fame in 1976. He retired from Johns Hopkins in 1995 after 41 inspiring and influential years. 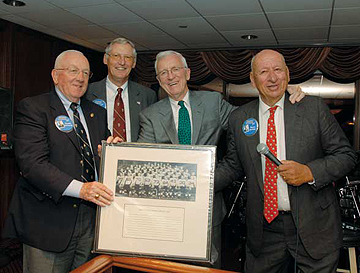 Dowell Schwartz, A&S '58; Rob Caples, A&S '58; and Wayne Schelle, A&S '58, acknowledge former Blue Jay coach and athletic director Bob Scott, A&S '52 (second from right), with the naming of a scholarship in his honor at the 50th Reunion dinner. Blair Johnson, Engr '08, can't remember exactly when she heard about the opportunity to become a student representative on the Johns Hopkins Alumni Council. But she says she'll always remember the experience. "I just love the school all over again," says Johnson, who graduated this spring with a civil engineering degree from the Whiting School and a minor in piano from the Peabody Institute. Blair Johnson with Catherine Connell, Engr '92, at the Leadership Weekend Luncheon last October. Johnson, a Kingsville, Maryland, native who will begin graduate school in coastal engineering at Cornell University this fall, served during her senior year as one of nine student representatives to the council, voicing issues of student life to the alumni leadership. Each academic division nominates a student representative to a one-year term. In this role, and in her current role as a new Alumni Association Student Ambassador, Johnson attended Alumni Council Executive Committee meetings, the Decker Quadrangle dedication dinner, and the Class of 1953 Reunion dinner. Both the Student Representative and the Student Ambassador programs aim to bridge the perceived gap between current students and alumni life. "When I'm interacting with alumni, it is refreshing to see how much Hopkins means to them," she says. Whether engaging in a discussion about a new alumni program with the council, or reveling in tales of campus pranks from the Class of 1953, Johnson discovered that the more things change, the more they stay the same. "The campus is still the same campus-it is still an environment for learning," she says. "Johns Hopkins is so important to these alumni that it made me so glad to be here." 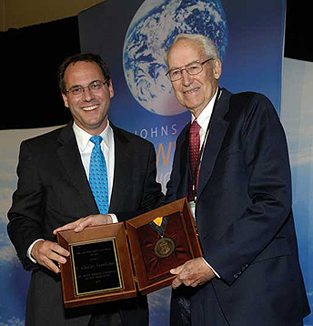 F. Charles Froelicher, A&S '49 (right), accepted the Johns Hopkins Alumni Association Distinguished Alumnus Award from Adam Falk, James B. Knapp Dean of the Krieger School of Arts and Sciences, at the Denver Knowledge for the World Tour stop in May. After graduation from Johns Hopkins, Froelicher spent 20 years as the first headmaster of the Colorado Academy, one of the finest co-ed K-12 schools in the country, and was instrumental in opening the country's first Outward Bound School in Colorado in 1961. He was also the first executive director of the Gates Family Foundation in Denver, supporting independent schools and colleges, preserving substantial parcels of prime open space, and working for historic preservation. 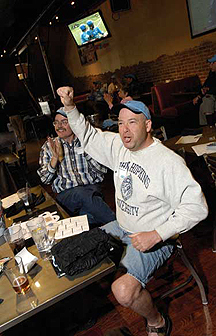 David Herman, Nurs '98, and Jim Nelson, A&S '75, cheer on the men's lacrosse team to a 9-6 victory over Charles Street rivals, the Loyola Greyhounds, on May 3 at a gamewatch event in the Mile High City. More than 30 Blue Jay fans joined Athletics Director Tom Calder for a "chalk talk" before the game.